It is a deeply personal journey and a canvas writ large for the colour, passion and inspiration of two disparate, diverse, deeply passionate and deeply in love people, Timothy Bruyns and Christina Thomas. Here are two of the most compassionate, tender people I know and I find myself both inspired and deeply touched by their adventure and the path they have, (as a couple) set upon. Timothy Bruyns is a young man with an infectious passion for his craft, bordering on obsession. His love of cooking and for exploring ingredients, techniques and flavours oozes from his every pore, it hangs like an aura around his very being. It is irresistible to hear him talk–at one hundred miles an hour–words tumbling over each other in their own excitement about his food and his life, the two always joined at the hip; he doesn’t do cooking, he lives it. One soon senses that there is a certain masochism at work here; he is a willing slave to his art, a captive of his own passions. A student of History, Philosophy and Politics at the University of Cape Town, Tim tossed in his shot at a degree to follow a growing passion for food and cooking, enrolling in the Culinary Academy of Cape Town. After graduation, he was soon honing his knowledge and skills under a host of talented local and international chefs in the country’s most celebrated wine region. Stints across continental Africa fuelled another passion, for travel, where Bruyns would further learn of new ingredients and cooking techniques and a sense of exploration, in the kitchen as well as on the road. Then a career slingshot arrived, landing a privileged and esteemed position in the kitchen of the very exclusive North Island resort on the Seychelles, from there Tim was part of an international team head-hunted to develop and run the restaurants of Song Saa Island, Cambodia’s first Luxury, Private Island resort: a whole, new world of ingredients, flavours and inspiration was again opening up before him. Song Saa would soon be the toast of the international media and awards circuit, the new jewel in the luxury travel crown. Everyone from CNN to Conde Nast was gushing about the new culinary hot spot on the map. And then, right then, just at the moment when the culinary globe had opened up to him, the passions would intervene once again. This time, passion would present itself in the form of the alluring Erato that is half Thai, half German siren Christina Thomas. Christina may look like she belongs on a Renoir canvas but, once a bond of trust has been formed you see a warmth, a compassion and a depth of spirit that would perhaps be best rendered by Lucien Freud. Christina is also an artist in her own right, a songstress and performer, yet there is an evident lack of the diva’s temperament here; one feels a compassionate soul akin to the proverbial mother hen of children’s tales. A friendly hug from Christina slays inner demons and silent sorrows you were not even aware you were dealing with. When Chef Tim’s passions run riot it is Christina who lashes him to her bosom, a mast of reason and warmth that rides him through the storm. There are times often that he needs this; unbridled it is nothing for this chef to work 18 – 20 hour days, end over end, in pursuit of some tiny, elusive sprig of excellence, up before dawn to scour markets, preparing and cooking all day till the end of evening service and somehow finding time in between to refine and research and develop new dishes, Tim himself forgetting to eat, sleep or uncoil his tension in the process. I once noticed some masking tape stuck up on an unseen wall in their restaurant, on it Christina had written, ‘I love you more than the stars in the sky, come home soon my king’, Tim had decided to stick it on the wall facing the entrance to his kitchen, as a constant reminder that this was not his only universe; for his own wellbeing he had to remember to sometimes stop and feed his soul. Their ensuing bond and commitment to each other meant it was time to leave the island for Tim and it was time to settle in Phnom Penh together and open their own restaurant, a first for both of them. 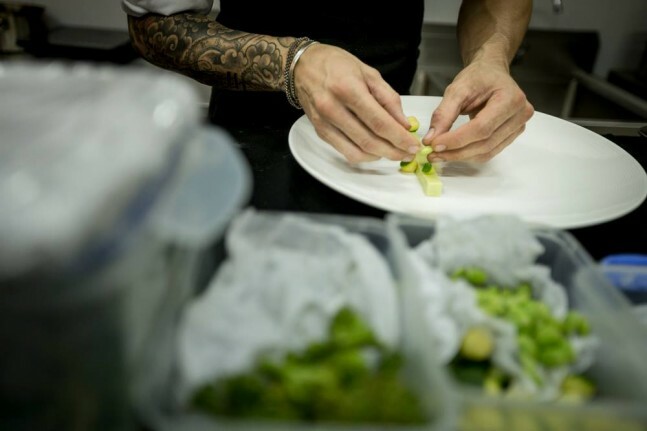 Tim’s stated aim was to bring highly refined, pangean cuisine with a focus on the very best available local and seasonal ingredients, delivered in a way and presented in an environment that was relevant and accessible to people. 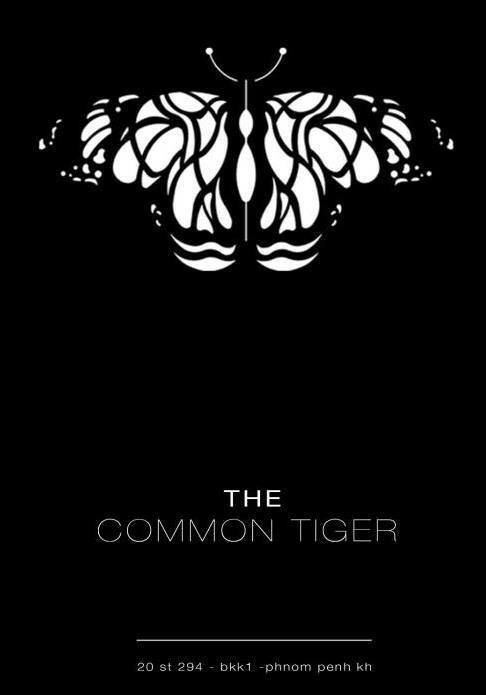 The China plates at The Common Tiger are bare, white and very large, the dishes themselves are–by comparison–relatively small, complex, artistic and colourful, like a Matisse, full of flourishes, dabs, daubs and accents. However, further sensory evaluation soon reveals them to be works that are a lot more than mere colour and light, every nuance contributing to the whole, in flavor or texture, either as a contrast or a bridge, a seamless symphony rather than a mosaic collage, every dish a journey and a discovery. Often, a discussion about the dish with chef will reveal weeks of searching for certain ingredients, months of curing, hanging, drying, salting or maturing, days of smoking, rubbing, marinating, hours of poaching, simmering, suos viding, not to mention elements of deconstruction, molecular realignment or, some long forgotten traditional technique learned from an elder in a village or market. Absolutely everything is made on the premises utilizing personally sourced raw ingredients, from the sour dough bread and the ‘smoked’ butter to the various gels, sauces and stocks and then there are the proteins, which are often hung, rubbed, smoked or manipulated in the kitchen to chef’s personal specifications. It seems to me that creating dishes of such fresh, vibrant, tantalizing beauty requires a labour of love that is so arduous and torturous that I imagine few chefs having the depth of passion to endure it. This is a very special talent indeed, a rarity and dare I say it, a brilliance that pushes boundaries for both creator and client; here is food that awakens once senses as well as it sates them. Dishes become something more than food on a plate, they have more sophistication than the artisanal, yet more depth and soul than the artistic. Who can describe love in any form? One thing I do firmly believe, is that the things created with the greatest of passion and devotion are some of the most special and precious things any of us will ever enjoy on this earth, The Common Tiger is one of those rare places that reinforces this view and puts it out there for us all to enjoy. softly, persistently into your quivering ear.